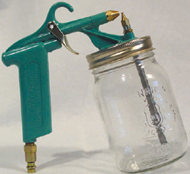 Large capacity spray gun suitable for spraying most ceramic liquids. Ideal for covering large surface areas. Comes complete with one plastic pint jar. Requires 30 - 40 lbs. of air pressure from reservoir tank type compressor. Snap connector required for connection to 3/16“ HL Hoses.